The Forest, also entitled Rayonist Landscape or Rayonist Perception, which was shown both in Mishen (Target), the exhibition organized by Larionov in Moscow in 1913 marking the new movement’s introduction to society, and in the solo exhibition of the painter’s work organised by the gallery owner K.I. Mikhailova at his Art Salon in Moscow that year, is an illustrative example of Goncharova’s interpretation of Rayonism. If we compare this painting with Larionov’s Street with Lanterns, also belonging to the Collection, we find that it differs substantially from that of her companion. 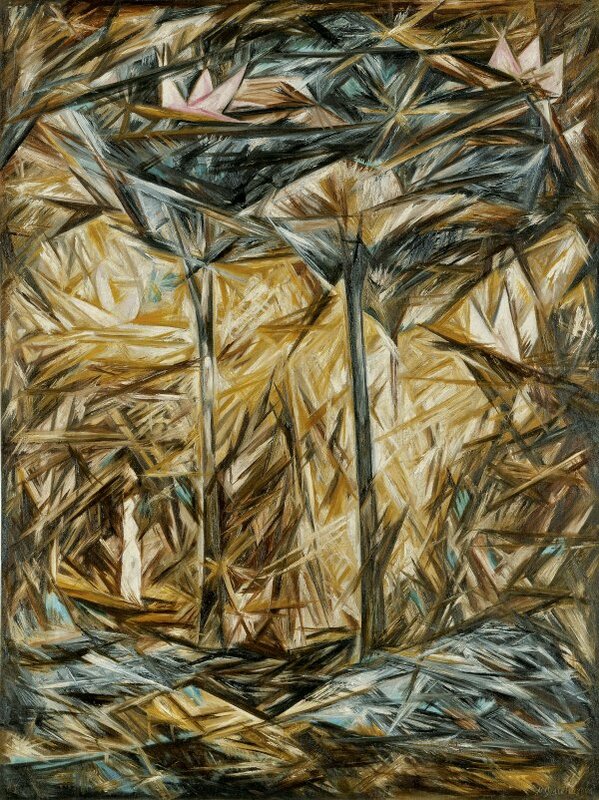 Whereas Larionov’s Rayonist paintings always give the impression of being rapidly executed experiments, those of Goncharova appear more convincing, more thought out, and more balanced. What is more, although as a rule they contain thematic undercurrents or certain references to the real world, in this case the interior of the forest and the necessary interweaving of coloured rays stretching in different directions give the painting an abstract appearance. Although a short-lived movement, Rayonism was important in that it paved the way for abstraction in Russian art.